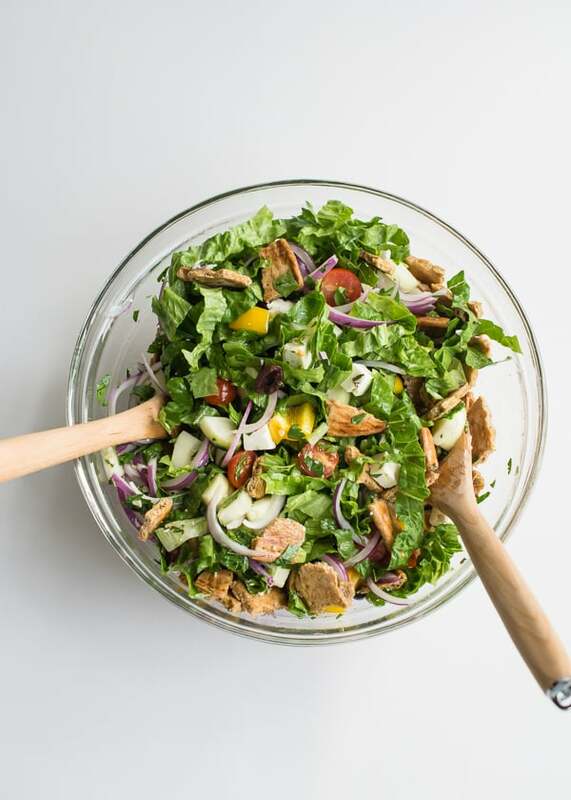 Greek Fattoush Salad Recipe from Oh My Veggies! For me, once I discovered panzanella, an Italian bread salad, there was no going back. Toasted cubes of bread tossed with veggies and a vinaigrette — with just enough crunch to satisfy and just enough give to soak up some delicious dressing? Not to be all melodramatic, but the first bite is a bit of a transcendent experience. It wasn’t long after panzanella and I became BFFs that a Lebanese friend introduced me to fattoush. Instead of rustic cubes of bread and fresh strips of basil, with fattoush, you’ve got toasted pitas and sumac. Both bread salads are usually also comprised of greens and lots of other veggies (cucumber and tomatoes are biggies), and then it’s all tossed with a vinaigrette-style dressing. Bread salads are an excellent way to use up, say, those two remaining lone pitas going stale at the bottom of the bag, or those last few slices of day-old bread. No slice left behind! 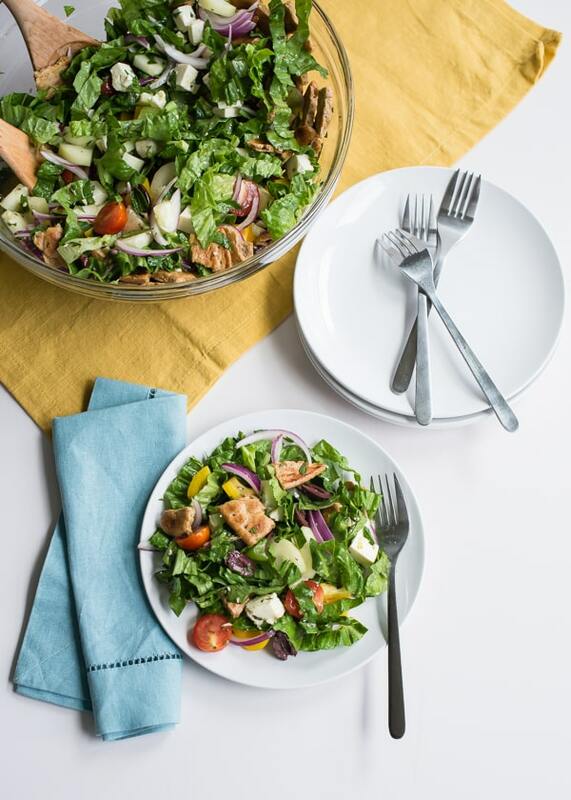 I took some liberties when creating this salad – authentic fattoush this is not! This is a mash-up of your typical Horiatiki-style Greek salad and traditional fattoush. From the Greek salad side, we’ve got thinly sliced red onions; bite-sized chunks of cucumber, bell pepper, and tomatoes; and a generous dose of kalamata olives and feta — plus, a garlicky oregano-laced vinaigrette. Toasted pitas — tossed in olive oil to help them retain some crunchiness once the dressing hits them — and crunchy romaine lettuce are a nod to the fattoush side of the equation. 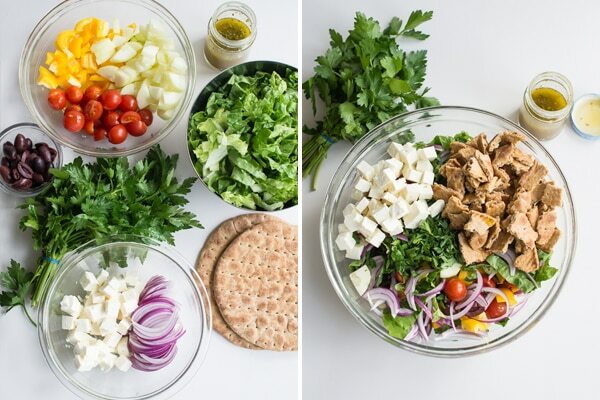 Together as one, they make up a colorful, refreshing summer salad that delivers a mega dose of Mediterranean deliciousness. Sog, schmog: just bring on the bread salad! The best of both worlds! Two Mediterranean salads, Greek salad and fattoush, come together in this refreshing (and easy!) recipe. Cut the pitas in half and place them on a baking sheet. Bake, turning once, until golden brown and toasted, 10-15 minutes. Let cool. Break or cut the toasted pitas into bite-size (1-inch) pieces. Add them to a medium bowl and drizzle 2 tablespoons of olive oil over the bread. Toss to coat. Sprinkle with kosher salt and toss again to distribute. Set aside. To a large bowl, add the lettuce, cucumber, bell pepper, tomatoes, onion, parsley, and olives. Toss. Make the vinaigrette. To a small bowl, add the 1/3 cup olive oil, vinegar, garlic, oregano, salt, and pepper. Whisk until blended. Add the pita bread pieces and the feta to the salad. Drizzle the vinaigrette over the top. Toss gently to combine. Serve immediately. Color me intrigued! That’s beautiful! There is nothing better – cheers to Greek salads! Oh this looks fabulous!! I love fattoush salad, and Greek salad, so this is the best of both worlds for me. This salad looks like the perfect combination I’ve been waiting for my whole life. Greek meets fattoush? Yes please! I’m all about salads during summer time and love experimenting with new flavors and combinations, so I’ll be making this for sure, especially because, since I’m a huge bread-lover, I love anything with bread! When I first encountered bread in my salad, I thought it was the strangest thing. But after coming across it again and again, I’ve learned that when done right (seasoned & spiced), it turns salad & bread into one bowl of the best of both worlds. Love how you’re going one step further with the greek spin on fattoush. Looks lovely! I totally agree with you! And thanks! Oh heck yes!!!! LOVING this take on my beloved fattoush! So you’ve gone and combined my two favorite summer salads into one! What could be better? !